My opposites project came to an end. I made four lino prints based on the words on posters I came across at the Mary Ward Centre. I used machine embroidery to create colour on the design. I added a little hand embroidery too to give it more life. I included little portraits of the students on three of the four sub pictures. 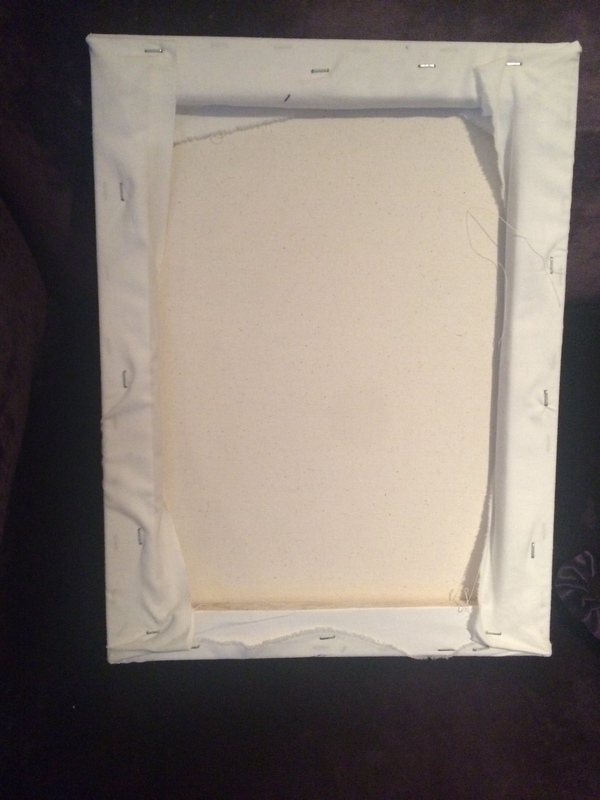 Finally I used a ready stretched canvas as the base, and stretched the pressed fabric over the wooden frame. Then using my husband as a helper we stapled the cotton to the canvas. On the front I wrote the title of the piece in felt tip pen; DO/ DO NOT DO, and signed it with my blog name – if people are curious to understand it they will have to read the blog post. I did two versions of this picture – I have kept one for myself. This one will be mounted too – and then I will have to decide where to hang it up. In some ways this block print and embroidery is a little protest – a tiny political act. I wanted the Centre to accept it as a supportive critique of their messaging. 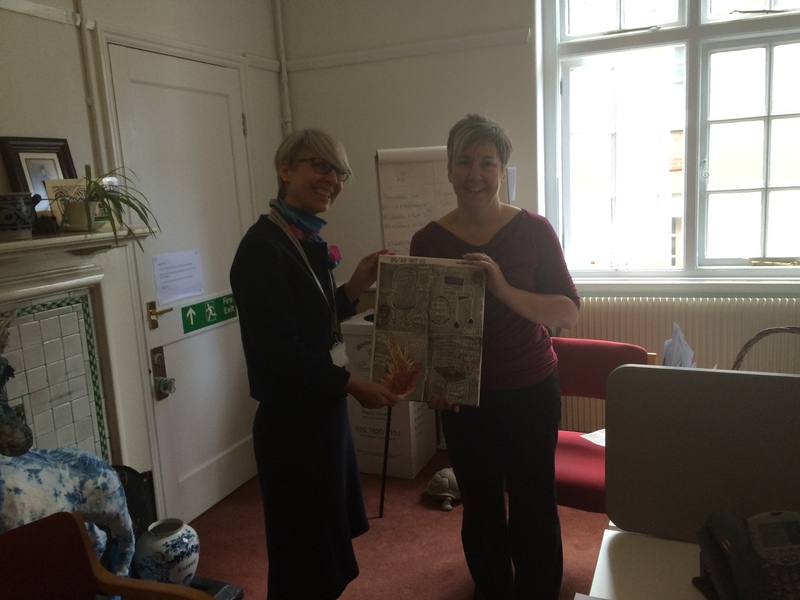 This week I finally got an appointment with the principal of the Mary Ward Centre, Suzanna Jackson. Unfortunately she was ill but I was able to make the presentation to Sue Craggs, the Head of Adult and Community Education. 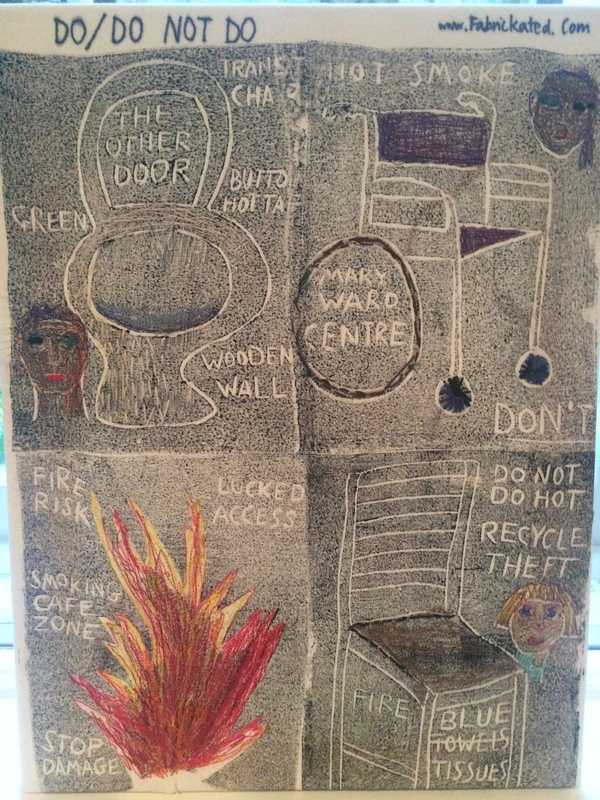 The photograph was taken by Felicity Baird the Principal’s PA. Sue listened carefully to my story of the why I made the art work, and took on board my critique of all the notices around the college. I suggested they may like to engage with the students on the issue of how communication is managed in order to make it both more effective and more beautiful. Love it especially the photo which shows exactly what you are getting at with the two signs ruining a lovely door. Actually I didn’t notice those notices until now – but there were several on the other wall. In the fireplace was a brilliant indigo printed zebra made with the British Museum which I felt should have been on display to the students rather than sitting in the Principal’s office. It will be interesting to see if your constructive criticism results in positive adjustments of the cranky confusing and unsightly signs. My favorite sign was in an office building where I had an office. There was only one restroom and there was general discomfort with having it be used by all, so the administrative person (rather sensibly) decided that since the staff on that floor was about 75% female it should be a women’s bathroom. Then she made a very professional looking sign that said something like “There is only a women’s restroom on this floor; male staff are encouraged to use the stairs”. When someone laughed hysterically at THIS she amended the existing sign to say “….to access a men’s room on another floor”. But of course it was too late by then, at least we all had a good if unkind laugh at her expense. anyway, looking forward to follow up. “THIS IS A COMMUNIAL FRIDGE AND IM SURE YOUR NOT THE ONE CLEANING IT!” (sic)…!